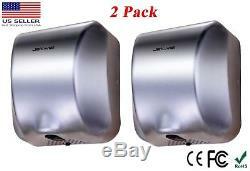 2PACK High Speed Commercial Automatic Stable Stainless Steel Hand Dryer. 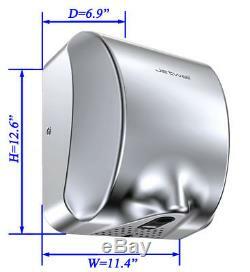 About Machine These are 2 Pack hand dryers Dimensions: 11.25"L x 6.75"D x 11.75H. Power capacity: 1800W(Hot)/ 550W(Cold). Hand drying time: 8-10 seconds. Operate at 74 dB+ - (decibels) using a brush motor. It can plug into traditional wall outlet. You also can cut the head if you want it to be a wall surface mount hard wired. 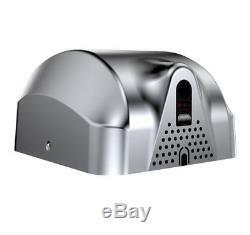 Hand Dryer Made of stainless steel, this hands drying device is a corrosion-proof will last for a long time. Lab test more than 500,000 times without problems. 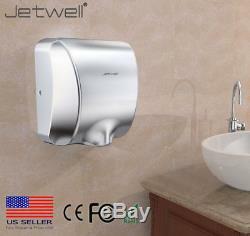 With high-speed function that delivers a 8-10 second hand drying and 3 times faster. Standards This drying device ensures healthy and efficient hand drying and offers excellent hygiene conditions. This is a eco friendly product. Energy saver and uses 80% less energy. 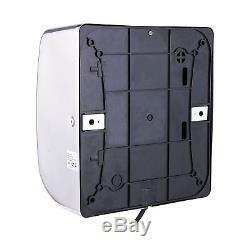 Available with cold and warm air switch to save energy. Available with blue LED light or UV Lamp in the nozzle. With a modern and sleek design, the absolute combination of drying efficiency and stylish bathroom accessory's finally here! 95% cost savings vs paper towels. Jetwell LLC own the professional product manufactures, eliminating middlemen so we can pass the savings onto you, also keep machines have the stable quality. Our number one commitment is to provide unbeatable service at unbeatable prices. We look forward to building upon our tradition of excellence by continuing to provide exceptional products and services. In this during, any issue please contact with us, we will absolve the issues in time. Thank you for your shopping. We're so excited to hear you're happy with our product! We should be appreciated if you would leave us a 5 star posibive feedback. We look forwarde to serving you again in near future. Q: Can this product be hardwired? Or only can be pluged in outlet? A: Yes you can hardwired, just cut the head of the wire then it become a hard wired. You also can plug it in outlet to use directly. Q: How long is the hand dryer auto cut off time? A: The auto cut off time is 60 seconds. Q: What is the materials of the cover? A: Yes they are 304 stainless steel and be in polish finished. A: Yes it has the install instruction and you can install it easy according it. Q: What is the out air temperature? A: About 104° F (40° C) to 77° F (25° C). Office Hours: Monday through Sunday 9:00 A. All e-mails will be responded to within 0-12 hours. 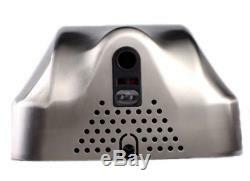 The item "2 Pack Jetwell High Speed Commercial Automatic Stable Stainless Steel Hand Dryer" is in sale since Wednesday, May 23, 2018. 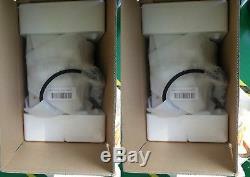 This item is in the category "Business & Industrial\Cleaning & Janitorial Supplies\Other Cleaning Supplies". The seller is "jetwell" and is located in Alpharetta, Georgia. This item can be shipped to United States.